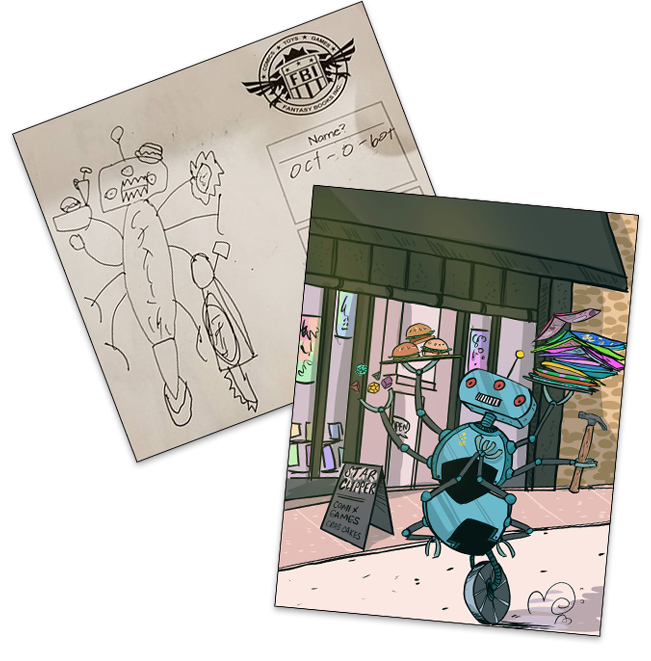 Oct-o-bot was created by Jake, age 12, at the Free Comic Book Day Superhero contest. Octobot Prime was constructed from materials taken from the core of his home planet many light years from Earth. Octobot prime was dormant within the planet until an explorer accidentally reactivates it and when Octobot Prime realizes that their planet is dead they travel to Earth to conquer it. To aid in its conquest of Earth Octobot Prime constructs a clone army. One of the clones, Oct-o-bot, goes rogue and rebels against its creator. Oct-o-bot joins forces with Dolphina, FeraGirl and Nature Girl to stop Octobot Prime’s nefarious plans. During the battle Octobot Prime sacrifices all of the other clones and attempts to steal top secret intelligence from US submarines. Oct-o-bot sabotages the submarines with his interchangeable arms and Dolphina uses her water powers to send Octobot Prime to the bottom of the ocean, all the while declaring his revenge against his rebellious clone. Oct-o-bot is now a force for good, using his programming and interchangeable parts to help people, play games, serve food and drinks and generally bring fun and happiness to all. *Super Hero contest open to kids 12 years and younger.